Add PHF8 polyclonal antibody - Pioneer to my shopping cart. Request a quote for a bulk order for PHF8 polyclonal antibody - Pioneer. Please fill out the form here below. Your local sales account manager will get in touch with you shortly and send you a quotation based on your requirements. 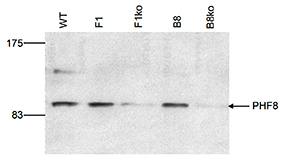 Polyclonal antibody raised in rabbit against human PHF8 (PHD finger protein 8), using 3 different KLH-conjugated synthetic peptides. 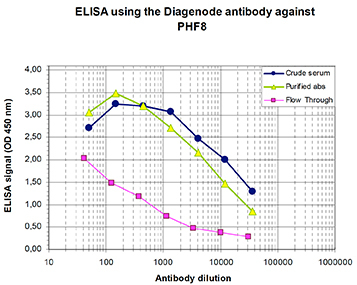 To determine the titer of the antibody, an ELISA was performed using a serial dilution of the Diagenode antibody directed against human PHF8 (Cat. No. pAb-064-050), crude serum and Flow Through in antigen coated wells. By plotting the absorbance against the antibody dilution (Figure 1), the titer of the antibody was estimated to be 1:6,500. E14TG2A mouse embryonic stem cells were transfected with a conditional allele of PHF8. Nuclear extracts (135 μg) from wild type cells (WT) and from 2 clones (F1, B8) with an active and a targeted allele (F1ko, B8ko), respectively, were analysed by Western blot using the Diagenode antibody against PHF8 (Cat. No. pAb-064-050). The antibody was diluted 1:1,000. The position of the protein of interest is indicated on the right; the marker (in kDa) is shown on the left. Diagenode strongly recommends using this:	PHF8 polyclonal antibody - Pioneer (Diagenode Cat# C15410064 Lot# A138-0031). Click here to copy to clipboard.